I sometimes question if I’ll ever get better and it’s in those times that my brain tries to convince me that, “no, I won’t”. The last 12 years have been a constant battle to get on the right side of feeling better and it’s been exhausting. My emotions go from feeling exhilarated during the times when I’m “succeeding” and almost feel like I’ve got a handle on things, to feeling absolutely dejected because of yet another setback. I judge myself most harshly for not being able to “get better” and the self-shaming game is huge. Despite my logically knowing that relapses happen during recovery, I blame myself every time one happens because I’m not good enough at recovery. I’ve spent my life wanting to be good enough. To be a good enough daughter, mother, sister, friend, wife and employee. The only area that I ever felt like I was almost good enough was in my career and that has been taken away from me – due to my mental illness, it has been difficult for me to return to full-time employment for a sustained period of time. This has cost me much needed knowledge to remain competitive in my field so I have been stagnant. 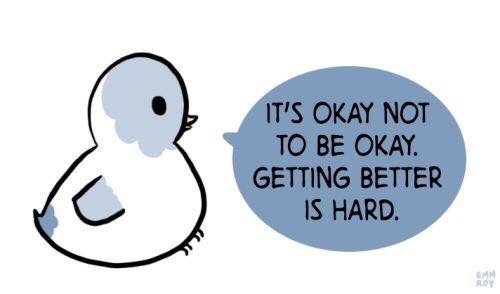 Getting better IS hard. And what is “better”? Perhaps I should be looking at it from the perspective that it’s not necessarily “better” that I hope to achieve – it’s “different”. Maybe then I can stop the shaming that comes with not being “better”, because that insinuates that how I am right now is ok. And even though I’m different now, that’s not a bad thing. I’m going to work on accepting that how I am in this moment is good enough. I will continue to evolve into something different and stop labelling each step in my journey as worse or better. It just is. I don’t know where I will end up tomorrow – I’m just going to do my best to live in today. This entry was posted in mental illness, Uncategorized, Wellness and tagged BPD, change, Mentalillness, recovery, yegblogs. Bookmark the permalink.